We've been having a glorious Indian summer here, but all that's going to end when the rain kicks in this weekend, cooling the temperatures back down to normal November weather. Booo! I'm not going to complain too much though, since I get to break out some of my favorite soup recipes again. We eat a lot of soup when the cold sets in, and paired with some buttered bread, it's a terrific cold weather comfort food. I've printed off a few soup recipes from Golden Blossom Honey to try this winter, and gave this Corn Chowder recipe a whirl last week. It was warm and filling, and surprisingly even my two picky eater girls ate an entire bowl. Jason's not much of a soup eater, but he insisted that we add this recipe to the "make again" section of our recipe folder, but asked me to add sausage to his bowl on the next round. I'm not a fan of sausage, but for those that are, you might take that suggestion into consideration. What's your favorite kind of soup to eat during the cold weather months? Tomato soup with grilled cheese is one of my favorites. That's one soup I will eat year round! I don't think I've eaten soup in like 25 years lol it is getting normal November weather here too, hmph to that. This does look good. My mom makes this kind of soup for Christmas Eve. It's a different recipe. I like this Southwestern Pumpkin Soup. I don't know if I should be eating it, but it's damn good. What is this Southwestern Pumpkin Soup? You'll have to post the recipe Alissa! That looks good, but I would have to leave out the bell pepper. That is one of the only food items I truly despise, in any recipe. :( Makes me sad because so many recipes call for it. As for our favorite soup during the winter months has got to be taco soup -either traditional with beef, or with rotisserie chicken in the crock pot. Sooo hearty, simple and yummy! My husband isn't a fan of peppers because he burps them up all day after eating them lol. He will tolerate them in small doses, like in this soup, but I can't make things like stuffed peppers because he won't eat them. Taco soup is one of our favorites! I haven't made it with rotisserie chicken, but we are definitely going to try that next time! Nom, Nom! I want to try this. It sounds phenomenal. This is perfect for warming up in our neck of the woods. Yum! I am all for some meals that fit perfectly with the colder weather - thank you so much. I love a good soup when the weather gets cold. 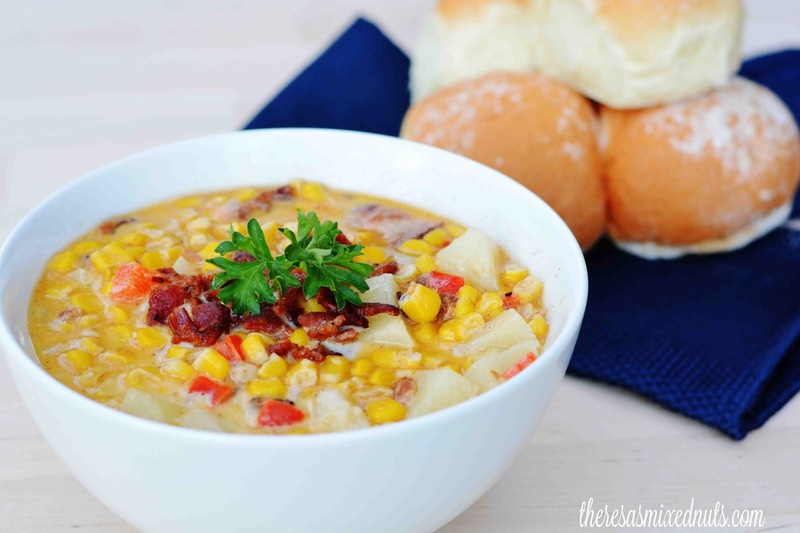 This corn chowder would hit the spot. This would warm me right up. I love a good corn chowder in the fall! It's a real comfort food. I love corn chowder! This sounds amazing and I think I may have to make it this weekend! I know this is something that my mother would just love and she does not cook too much anymore. I will make this for her when she comes to visit this month. That looks yummy and filling. I can't wait to try your recipe. My husband is big on soups and chowders. I need to make this for him. Your dish looks delicious. I love how colorful it is and honey in the recipe sounds YUMMY! I've never had the pleasure of eating corn chowder. This one looks so hearty and perfect for a cold day in the fall. This looks so delicious and easy to make. I will have to try this recipe on the weekend. It is the perfect weather for soup. I love corn chowder and was just thinking about how its so warm in Florida that I won't need corn chowder this year. I think I need to address this! The idea of corn chowder sounds perfect right now. It has been getting cooler here. I would prefer beef over bacon & this looks like a wonderful soup to try out during winter in particular. This looks like an easy recipe to try out & I would love preparing it sometime this winter.